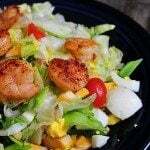 Chef Salads come in all sizes and varieties, but there are always a few things they have in common – crisp greens, two types of meat – either ham, bacon, chicken, turkey, or another favorite, hard boiled eggs, vegetables, and cheese. 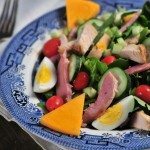 And since this is a version of a chef salad that I love to make and serve as a meal after I’ve made baked ham, I thought it would be perfect to share with you right about now, too. 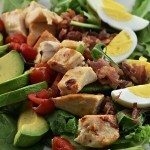 What makes this chef salad different from all the others? Well, I top it with deviled eggs! It’s perfect for after the holidays if you still have a little ham leftover and are looking to lighten up the menu just a touch. 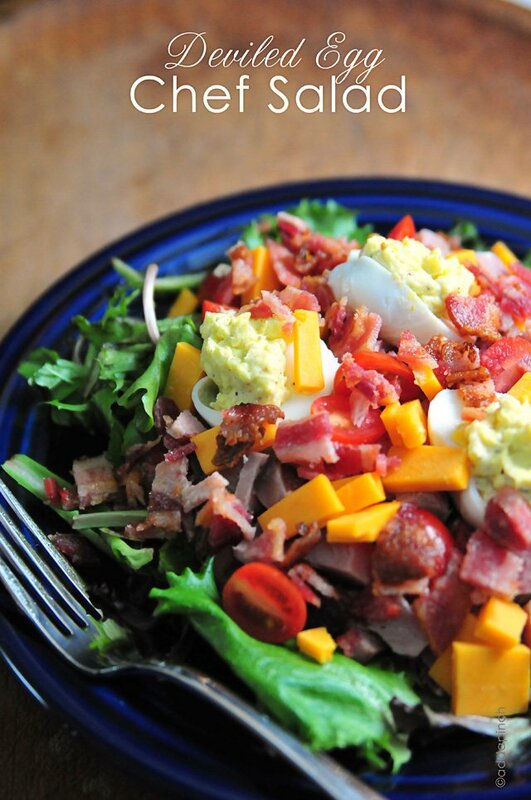 If you have leftover deviled eggs, you can have this salad thrown together in no time flat. I’m a bit taken with this chef salad now. 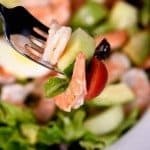 Maybe it’s because I’m switching over from all those heavier meals from the holidays to something a bit lighter and this salad definitely doesn’t leave you hungry in a few hours. Filling and satisfying, it’s perfect for supper even. 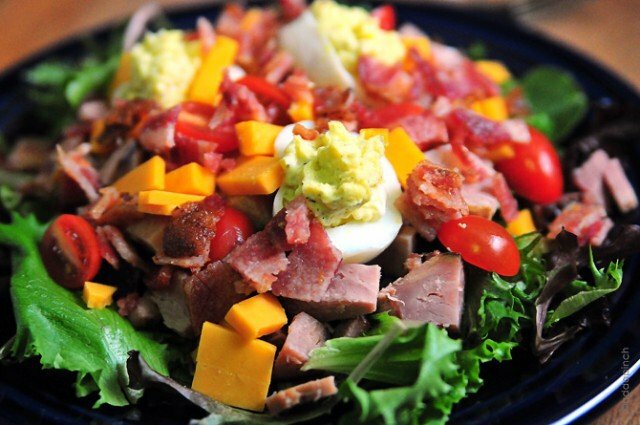 Here’s the recipe for this Chef Salad, but really just make it your own. Toss in whatever leftover protein you may have on hand – chicken, turkey, or ham. A combination always works well, too. But, will you do me a favor? Promise you’ll try the deviled egg sometime really soon. 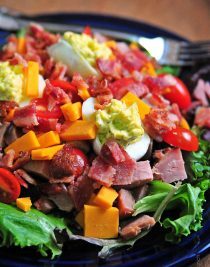 Oh my goodness, putting deviled eggs in a chef’s salad is pure genius!!! I think you’ll love it, Julie! It’s hard to have one without now! 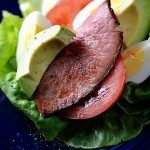 If you like deviled eggs, then I think you’ll really love the addition to your salad. Mmmm. So much flavor! This might be the most perfect Chef Salad ever. I am slightly obsessed with deviled eggs. What a great idea, Robyn. We love deviled eggs, but you can only eat so many of them as a side dish. Now I have another fantastic way to enjoy them! Thanks so much, Lana. We’re deviled egg lovers around here, too! I can’t tell you how much I adore them on this salad! 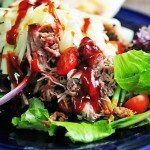 Salad is one of my very favorites for lunch and this is the best idea ever! Mine, too. I hope you like it! Yum! I’m all about salads now too. Perfect for all the leftover ham I have!! I’ve never actually had leftover deviled eggs! :-) This looks so good I’m going to have to make some. Thanks for the recipe! Such a unique salad idea. Love this! Have a ham in the oven right now, perfect timing! What a great idea for the leftovers. 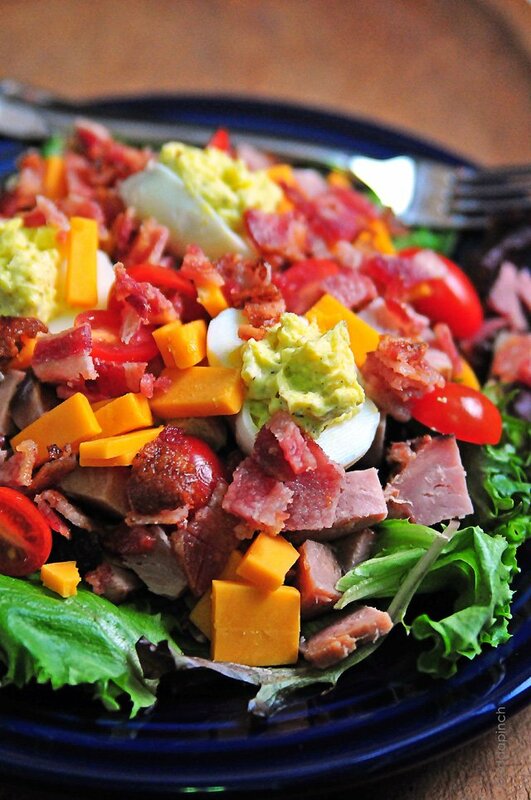 What a great combination…..salad and deviled eggs!!!!!!! Since we love both, this is a no-brainer. Thanks for sharing another fantastic recipe. And now I want to eat deviled eggs! And fresh yummy salad!! Wow! I just had a huge salad for lunch and deviled eggs would have been a perfect addition! This looks amazing and I am going to try this really soon! What a pretty salad and adding deviled eggs is such a creative and delicious idea. Which type of salad dressing do you prefer? Normally, I prepare a vinaigrette dressing to go along with it or a homemade ranch dressing. Whatever dressing you prefer works perfectly. I love salad and deviled eggs so this has to be good! You know I’m pinning it! !